There are at least three different versions of the UK101 motherboard. The first version of the motherboard that was available for sale is distinguished by the lack of the green solder mask. 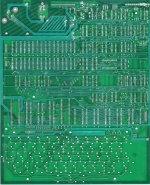 The second, and most popular, version of the motherboard has a green solder mask on both sides of the board. It is different from the third version by not having the word "EPROM" on the lower left of the board. Thanks to the hard work of jimmydeath on the Stairway to Hell forums, we have very high resolution scans of both sides of the version 2 motherboard. These files are ZIP archives of TIFF files, and are *very large*. 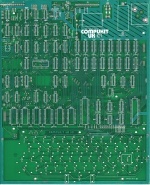 The third version of the motherboard is distinguished by the word "EPROM" appearing in the top copper layer in the lower left corner. It is assumed that this board has the correct chip select lines for EPROM versions of all of the ROM chips. This page was last modified on 13 January 2014, at 04:30.